Noise 1204. Silk organzine, linen, hemp, indigo. 200 x 77.5 cm, 2012. Detail of Noise 1204. Silk organzine, linen, hemp, indigo. 200 x 77.5 cm, 2012. 140710. Hemp, plant dye. 65 x 65 cm, 2014. 150217. Hemp, linen, sumi, indigo pigment. 95 x 65 cm, 2015. Detail of 150217. Hemp, linen, sumi, indigo pigment. 95 x 65 cm, 2015. 160805. Rayon, plant dyes, synthetic dye. 70 x 70 cm, 2016. 140715. Hemp, plant dye. 82.5 x 68 cm, 2014. Detail of 140715. Hemp, plant dye. 82.5 x 68 cm, 2014. 140716. Waxed linen, synthetic dye. 69.5 x 68 cm, 2014. 140805. Linen, synthetic dye. 95.5 x 88 cm, 2014. Frequency 1, Frequency 2, Frequency 3. Silk, linen, hemp, plant dyes, indigo, sumi. 166 x 52.5 cm, 2013. Detail of Frequency 1. Silk, linen, hemp, plant dyes, indigo, sumi. 166 x 52.5 cm, 2013. Left: Noise 1208. Tussah silk, hemp, synthetic dye, sumi. 245 x 52 cm, 2012. Right: Noise 1207. Tussah silk, hemp, synthetic dye, sumi. 245 x 52 cm, 2012. Noise 1206. Tussah silk, linen, plant dyes, sumi. 240.75 x 52 cm, 2012. Codex 5. Tassar silk, hemp, plant dyes, sumi. 160 x 56.5 cm, 2016. Detail of Codex 5. Tassar silk, hemp, plant dyes, sumi. 160 x 56.5 cm, 2016. My studio practice is rooted in a contemplative approach to cloth construction using natural materials and plant-sourced colour. I favour compositional strategies where both the duration of and intervals between pattern elements are based on random numerical sequences, measurements taken from my body, and antique winding tools made irregular with time and wear. In combination, these methods produce complexity and variations that echo patterns found in nature and the irregular symmetries of the body. As I engage with layers of complexity driven by factors over which I have little control, intervals emerge in which apparently random sequences coalesce into visible repetitions or patterns. In my woven works, random numerical sequences and ancient textile structures are interleaved creating both structural (specific to the interlacement of threads) and visual noise that interferes with the perceptual process. The online random number generator used in these pieces is driven by the atmospheric noise of lightning strikes. This link to natural phenomena is compelling for me, as it seems to conflate the digital and the natural. Ultimately the source of the integers I utilize to compose this work is immaterial as I am more interested in drawing one’s attention to the process of perception itself. In these pieces I am intrigued that hints of repetition, or the occasional alignment of apparently scattered blocks of colour may draw us to construct pattern and make meaning in that which we perceive. Recently I have transposed the compositional strategies used in my weaving to a new series of knit works. For each knit work I have devised a simple algorithm or set of instructions that act to codify organic form. As in the woven pieces, the frequency of pattern changes and structural manipulations are composed using random numerical sequences. Unlike the weaving however, knitting is not constrained by a fretwork of threads interlacing at right angles. Escaping the grid, the looping knit structure allows a more fluid approach, resulting in unexpected deviations from what was planned. The placement of holes, branches and turns are more intuitive. Decisions are made slowly and methodically as hundreds, eventually thousands of stitches accumulate and the form codified by the initial algorithm is revealed. There is an ordered logic to the rhythmic and cumulative processes of textile construction in which the ancient human impulse for pattern, order and cohesion is embedded as much into our idea of cloth, as it may be in the cloth itself. The intimacy of cloth made by hand, and our centuries-old familiarity with it make cloth not only related to the body, but itself another body. In my recent work I am compelled by the way in which cloth may intimate both human presence and absence (often simultaneously) and am fascinated by the notion of embodiment as it relates to the praxis of making cloth by hand. As a material aggregation of dedicated gestures, breath and thought enacted through an interval of time – cloth tacitly communicates the immaterial and enmeshes the intangible. 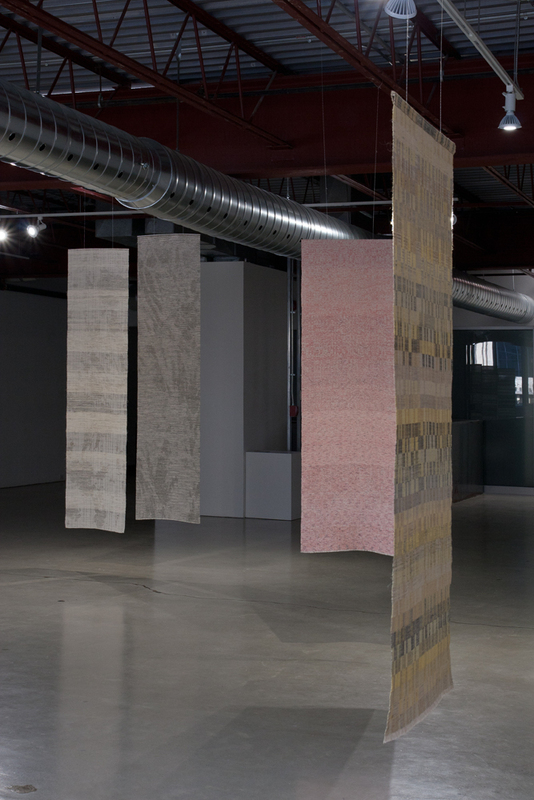 Mackenzie Kelly-Frère is a textile artist and educator whose work has been exhibited across Canada, including the Alberta Biennial of Contemporary Art: The News from Here in 2013 and Lieux de memoire: International biennale du lin du Portneuf in Deschambault-Grondines, Quebec in 2009. His international exhibitions have included China, Japan, Korea and the United States where he also participated in a residency at the Museum of Contemporary Craft in Portland, Oregon. 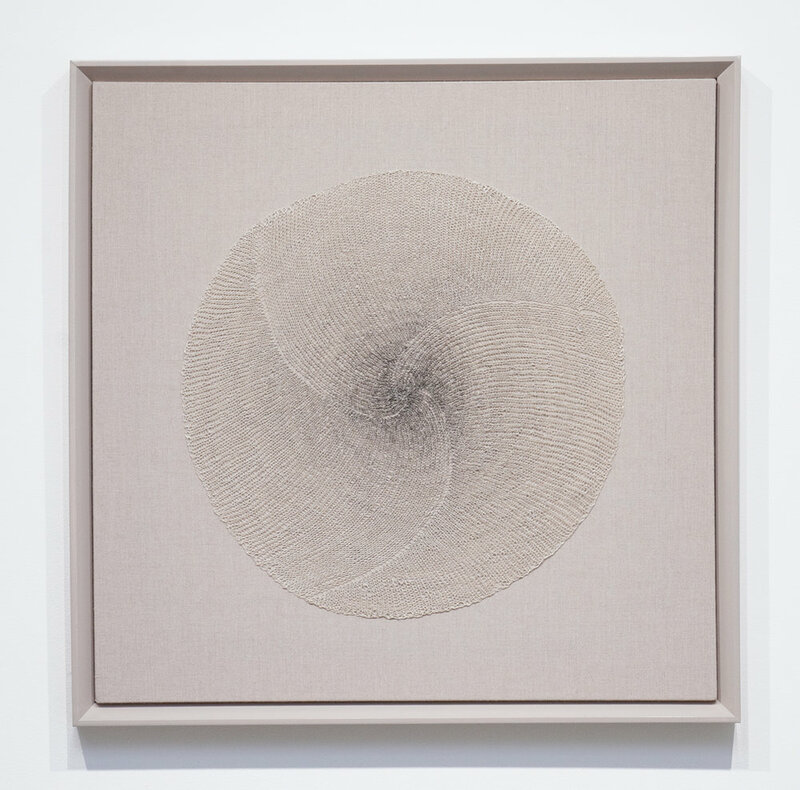 In 2014 Mackenzie mounted his first solo international exhibition titled Frequency for GalleryGallery in Kyoto, Japan. He has also contributed texts to various Canadian and international publications including Craft Perception & Practice Vol III and recently to Textile: The Journal of Cloth and Culture. Mackenzie teaches in the School of Craft + Emerging Media at the Alberta College of Art + Design in Calgary, where he lives with his husband Kristofer Kelly-Frère and daughter Elizabeth.